April 2015's most viewed Delaware Beach homes for sale includes listings in Bear Trap Dunes, Ocean View, Sea Colony, Bethany Beach, Bayside and West Fenwick Island. 124D October Glory Avenue, Bear Trap Dunes, Ocean View, Delaware, was April 2015's most viewed Delaware Beach real estate listing for sale. Coastal Delaware's ResortQuest Real Estate® unveils April 2015's Top 10 most viewed Delaware Beach real estate listings currently for sale, as seen on ResortQuestDE.com. Kicking off the second quarter of the year, a Bear Trap Dunes, Ocean View, Delaware resort condo - in a great location with golf and pond views too - caught the interest of more Web surfers than any other Delaware Beach real estate listing for sale. For more info, photos and current list prices for these popular Southeast Sussex County, Delaware beach homes now listed for sale, or any other active real estate listing, please visit the links below. 1. 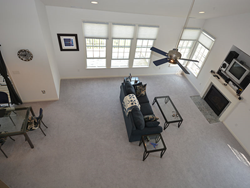 124D October Glory Avenue, Bear Trap Dunes, Ocean View, Delaware - 3BR, 3BA condo. What the listing agent said about this condo: "Remarkable upper end villa with golf & pond views from your great room and just steps to the pool. LOCATION, LOCATION. Pristine condition, never rented. Vaulted ceilings, open great room, oversized screen porch and deck. Enjoy this sought-after location for personal use or investment." For more information about April's Top 10 Delaware Beach real estate listings, or the latest on real estate in the resort and inland areas of Sussex County, Delaware, visit http://www.ResortQuestDE.com. ResortQuest Delaware Real Estate, LLC, a subsidiary of Wyndham Vacation Rentals North America, LLC, has provided real estate sales, vacation rental, and homeowner association management services to Bethany Beach, Sea Colony and other fine communities in Delaware's Quiet Resorts, Maryland and the surrounding coastal areas since the early 1970s. Its affiliate ResortQuest Delaware, LLC’s homeowner association management division represents the needs of more than 6,300 homeowners in 49 associations from Lewes to Fenwick Island, Del. Wyndham Vacation Rentals®, part of Wyndham Exchange & Rentals® and the Wyndham Worldwide family of brands, is the world’s largest professional manager of vacation rentals, providing access to approximately 103,000 vacation rental properties in more than 550 unique destinations worldwide. For additional information, visit our media center on wyndhamvacationrentals.com.